Ron Montbleau’s passion and drive has made the company a leader in architectural woodworking. Montbleau & Associates has plants in California and Mexico. An overview of Montbleau & Associates’ operation in Mexico shows the wide range of technology and manufacturing capabilities. 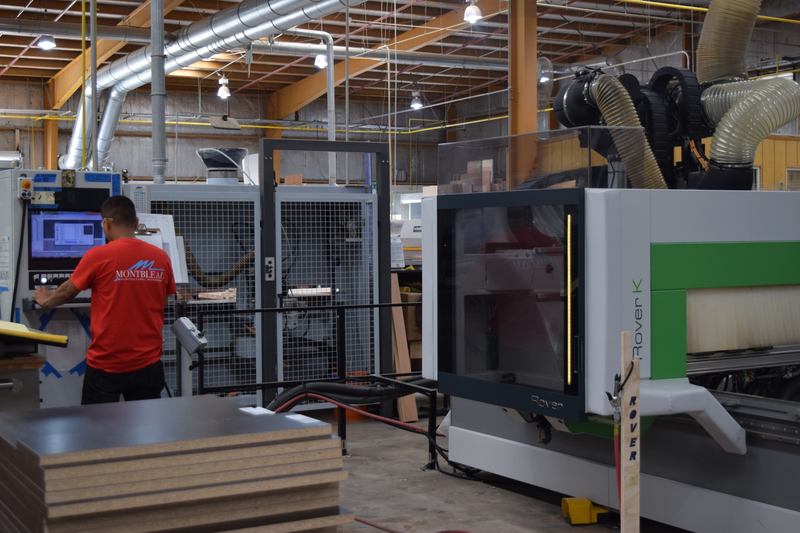 Montbleau & Associates has expanded and invested in high technology, including this Biesse Rover CNC router. At Montbleau & Associates' San Diego facility, the Biesse Winstore material inventory system can be programmed to select and transport the correct panels to the Selco WNT panel saw. Operations Manager Mark McDade checks the panel surface during the production process. 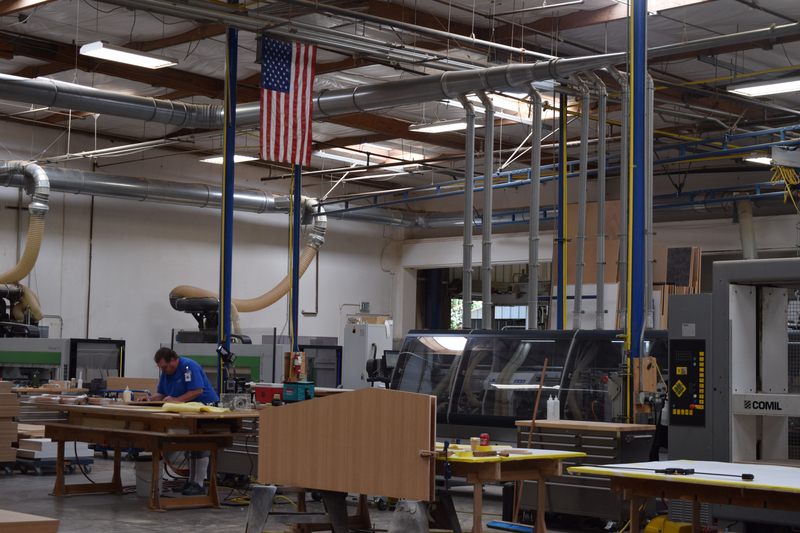 Other equipment used in Montbleau's facilities include IMA edgebanders, an SNX contour bander, Schelling panel saws, and a Homag CNC drilling and dowel insertion machine. Ron Montbleau and John Nash look over a part after it exits the machine. A full-service company, Montbleau & Associates specializes in bringing unique and complex projects to life. Pictured in progress is a 3D suspended wood ceiling sculpture for Amazon. When finished, it will feature an undulated bottom and intersecting, constantly changing angles. 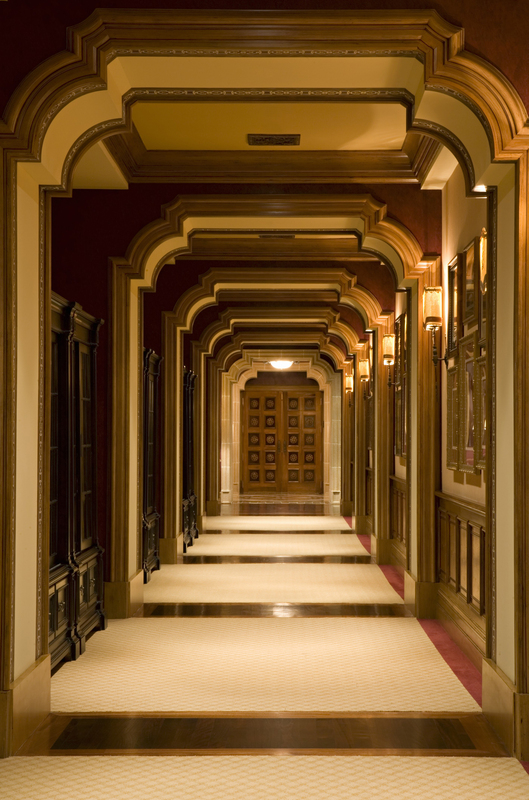 The project at the Grand Del Mar Resort included the wood entryways, beamed ceilings, decorative columns. The resort's interiors feature 20 different finishes on domestic and exotic wood species, including antiquing, glazing and distressing. Intricate details turn the ceiling into a work of art, at the Grand Del Mar Resort in California. The lush millwork creates a beautiful conference setting at the Pelican Hill Resort in California. Beautiful millwork draws visitors to the Wicked Spoon restaurant, located in the Cosmopolitan Hotel & Casino in Las Vegas, Nevada. 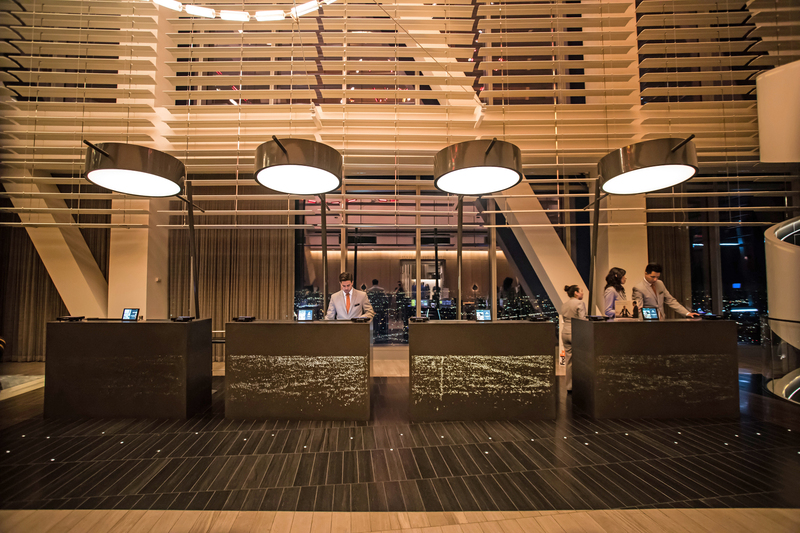 A LEED Gold certified development covering 67 acres in the Las Vegas Strip, the ARIA at City Center used the largest amount of FSC-certified wood in a single project to date for Montbleau & Associates. Sales at Montbleau & Associates are going through the roof, as the architectural woodworker’s ability to create award-winning, unique and complex projects continues to attract a host of high profile clients, including Google, Facebook, Apple and Amazon. The company’s commercial success in corporate interiors, healthcare and hospitality projects is clearly evident in its exponential sales growth over the past few years, with Montbleau & Associates looking to surpass $100 million by 2019. 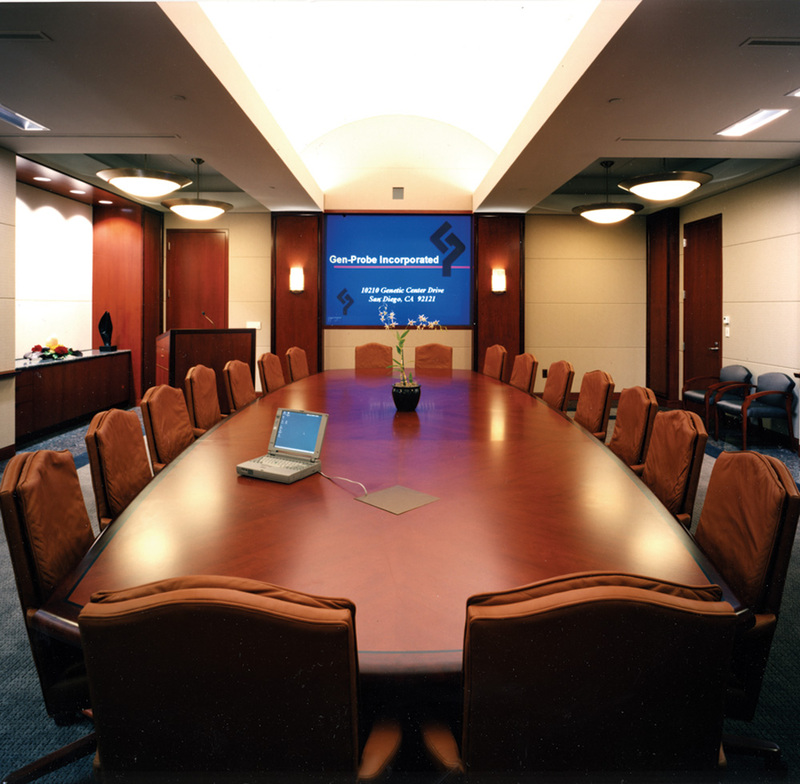 Founded in 1980 by Ron Montbleau, the custom woodworking firm specializes in high-end corporate furniture, casework, paneling, ceilings, millwork and more. Montbleau & Associates specializes in high-end architectural millwork for the hospitality, healthcare and commercial interiors markets. Pictured is the clubhouse hallway at the Grand Del Mar Resort in California. 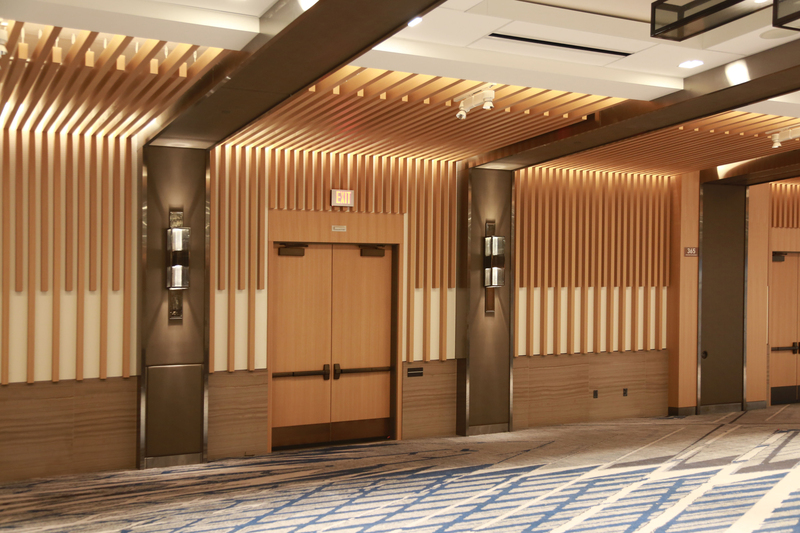 The mix of architectural millwork projects has ranged from 1,000-room Las Vegas hotel remodels and casinos, including the MGM Grand, to research labs and healthcare facilities, such as the Lucile Packard Children’s Hospital for Stanford University. The company has also done corporate interiors for banks and law offices – even the sea turtle exhibit at Sea World – as well as tenant improvements for high-tech firms in Silicon Valley, including a highly intricate, 3D suspended wood ceiling sculpture, with an undulated bottom and intersecting, constantly changing angles, currently under construction for Amazon. A full-service company, Montbleau & Associates offers preconstruction, estimating, project management, engineering, manufacturing, finishing and installation to clients. “The challenge is taking someone’s design or concept that’s in their head or on a 2D drawing and bringing it to life,” said Jake Nabors, director of preconstruction. When done right, the transition from design to finished product “is something that they are always blown away at seeing,” Rothman added. Technology is another key component of Montbleau & Associates’ success, and it’s the combination of technology and craftsmanship which helps separate the company from many of its competitors. Significant investments have been made recently in new technology and infrastructure. “In the past four years we decided that there’s going to be a significant wave of work in the marketplace, so we wanted to expand and meet that wave,” Montbleau said. Significant investments have been made recently in new technology and infrastructure at the company's facilities in Tijuana and San Diego. 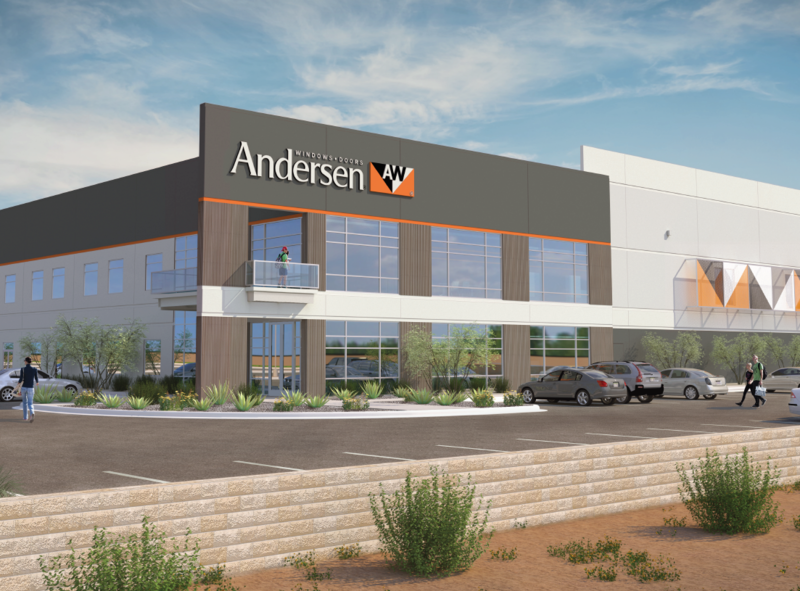 Combined, the company has 187,000 square feet of manufacturing and storage in San Diego, San Jose, Tijuana and Las Vegas. There is also 24,000 square feet of office space, including locations in Los Angeles and Reno. The manufacturing capabilities at the facilities are similar, giving the company flexibility in job creation while ensuring consistency, said Mark McDade, operations manager. Yet while production in San Diego tends to be more batch processing, the manufacturing in Mexico is designed for flow processing. 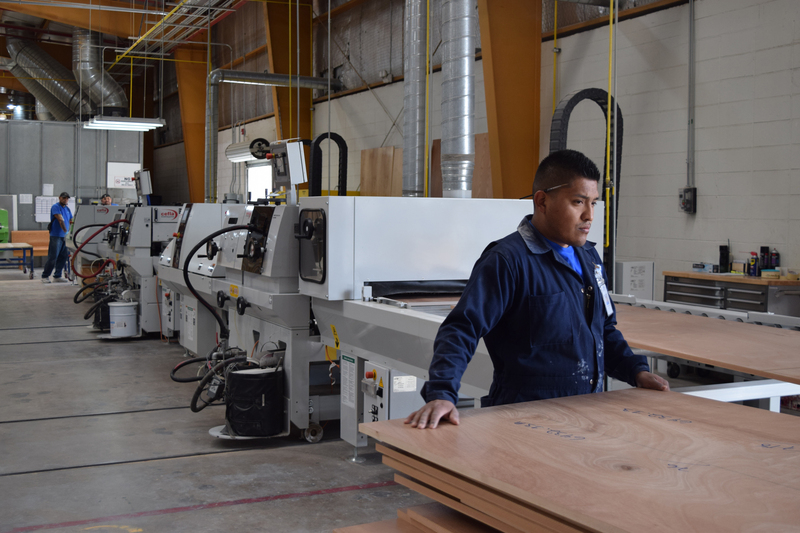 At the south facility in Tijuana, panels are cut to size on Schelling beam saws with lasers and bar code capabilities. Of the three panel saws, one is rear loading and two are front loading. The plants offer similar manufacturing capabilities, including 5-axis CNC machining on the Biesse Rover. The use of technology is evident throughout the plant, which boasts a five-axis Biesse Rover CNC machining center, plus three Rover CNC routers with nesting capabilities. “This gives us multiple ways to fabricate products, depending on their complexity,” McDade said. Complementing the nested-based routers is a Homag Optimat CNC drilling and dowel insertion machine. The company also has in place three edgebanding systems, including a Biesse Stream B single-sided edgebander capable of PUR and hot air/Air Force System invisible seam edgebanding, as well as an IMA Advantage single-side edgebander, and SNX contour bander. Among the finishing equipment used by Montbleau & Associates is the Cefla Smartcoater EVO roll coating system. 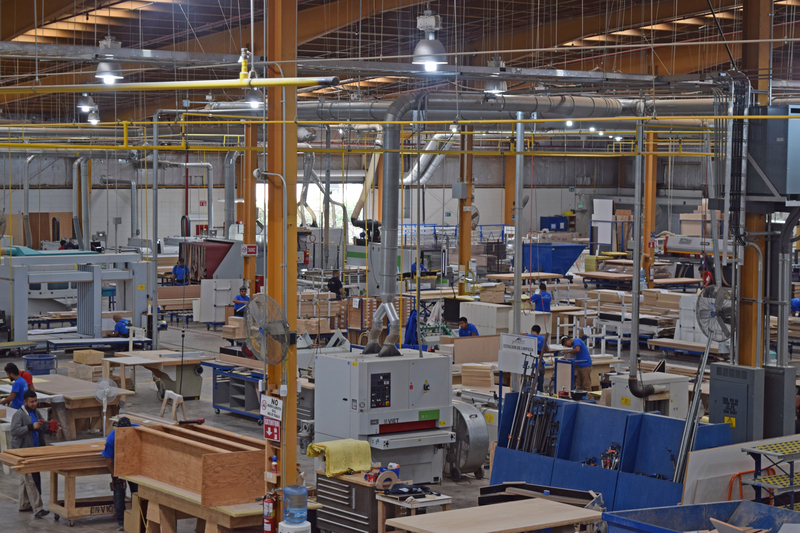 In addition to its manufacturing capabilities, what also sets Montbleau & Associates apart from its competitors is the furniture quality finish on products. Along with four Biesse Viet sanders and a Robatech sander, the company utilizes a Makor spray system and Cefla Smartcoater EVO roll coating system for environmentally friendly, UV finishing. Additional equipment includes Homag case clamps and a Hocker dust collection system. Investments have also been made in the recently expanded manufacturing operations in San Diego, including Hocker dust collection and briquetting systems for wood waste management. Like the south facility, the northern operation is also highly automated. Using software from Ardis, the Biesse Winstore material inventory system can be programmed to efficiently select and transport the correct panels to the Biesse Selco WNT panel saw. Once cut to size, the parts are machined on one of two Biesse Rover CNC machining centers with 5-axis capabilities, and banded on a Biesse Stream single-sided edgebander. Technology merges with handcraftsmanship at Montbleau & Associates. “I’ve always found that machine technology and handcraftsmanship are synchronous – they blend together very well, they play off of each other. The machinery just makes producing high-quality components very simple – you can do it over and over again, without the variables,” McDade said. “Variables in any business cost a ton of money, so when you have to stop and fiddle with every single part, even if it’s just for 10 seconds, it adds up really fast. So really good machinery is key to really good production,” he added. Cook agreed. “With technology we’re able to produce in mass quantity, with a high-end quality,” he said, noting the difficulty a craftsman faces in reproducing parts by hand. “Technology lets us go in and be able to do projects that are 2,000 rooms, 3,000 rooms…multiples,” he added, while keeping costs down and expectations high. Since the company’s start in 1980, the product mix has transitioned from custom furniture to yachts, to residential cabinetry and interiors, and from there into corporate interiors. “That’s when architectural woodworking became one of our products,” Montbleau said. Corporate interiors remain a specialty of the company, which also makes its mark in other commercial areas, including casinos, hotels and healthcare facilities. “Clients come to us because we offer the skill set of craftsmanship and quality. The ability to be able to deliver on time is really important as well, especially in big hotel projects or casinos,” Montbleau added. It starts with the family culture put in place by Montbleau, and it resonates with the estimated 350 people who work there. The company’s locations are rife with multiple generations and longtime employees who have been with the company 10 years or more. The future continues to look bright for the team at Montbleau & Associates. “Since we have expanded our facilities and machinery to produce a larger amount/volume of products, we’re looking to marketplaces where they need high-quality, repetitive work,” Montbleau said. He cited high-end condo towers as a target market. The company also has been able to parlay its relationships with local clients into projects in other regions. 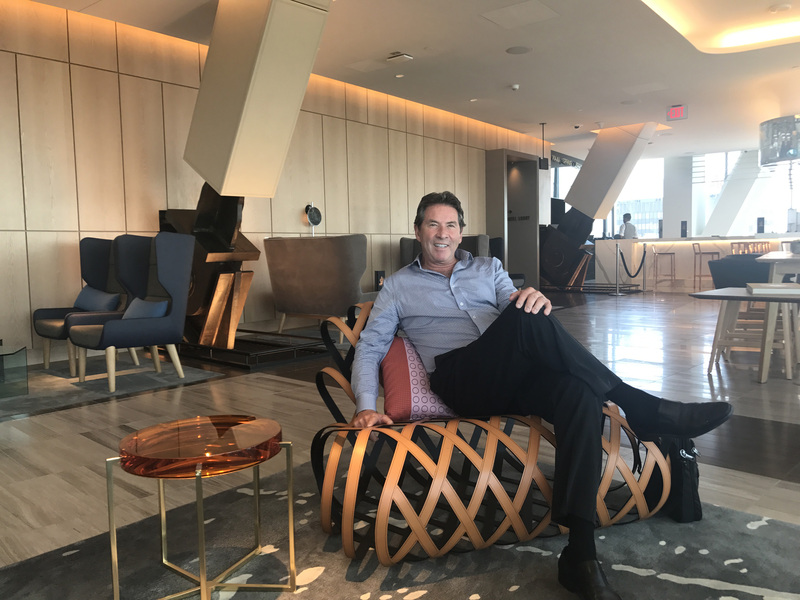 Seated at one of the company's recent projects, the Wilshire Grand Hotel, Ron Montbleau is already planning for the company's next growth opportunity. “I believe that the essence of what we do, that has allowed us to succeed over 38 years, is our commitment to bringing value to our relationships. Our relationships are circular from our employees, our suppliers, our clients – it is a relationship that has to happen in all directions and bringing respect and integrity to those relationships is key to our success,” Montbleau said. He added, “If I had to describe our company in one sentence, I’d say it would be the commitment to bringing value to our clients and the passion and integrity that we bring to our work every day. Watch a video in which members of the Montbleau & Associates' team discuss the company and its production process.